The graphs that we have looked at so far have all used preset colors. 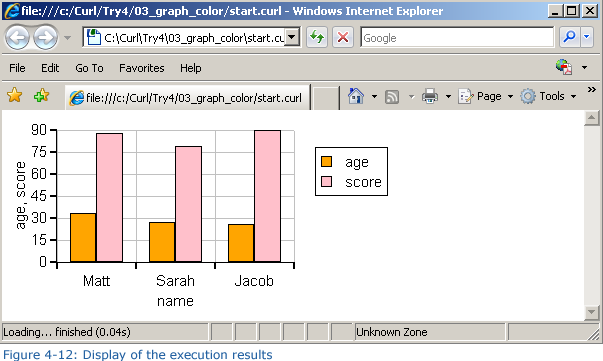 We can, however, use options to change the graph color. Close the Try 4-2 project and then, from the IDE 'File' menu, select 'New Project'. 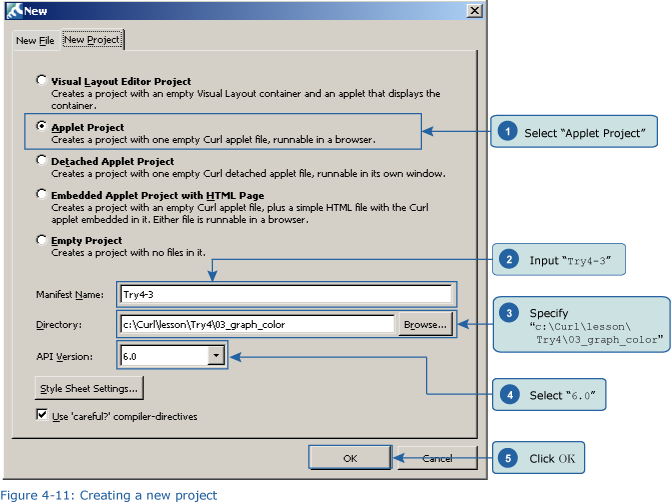 In the 'New Project' dialog box, select “Applet Project” (1), input “Try4-3” (2), specify c:\Curl\lesson\Try4\03_graph_color in the “Directory” field (3), set the API Version to 6.0 (4), and then click OK (5). Next, we’ll input the program. You can copy the program code below or use c:\Curl\Try4\03_graph_color\start.curl and then paste it into the editor in the IDE. The samples that we have looked at so far have all used preset colors for the graphs. Here, we have set whatever color we like for our graph display.